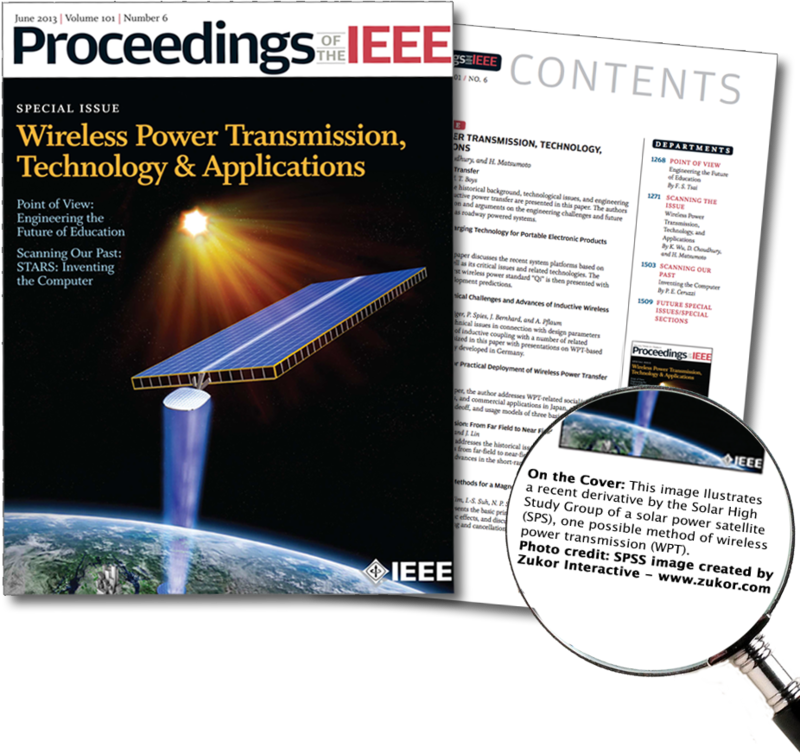 The cover of the prestigious technical journal “Proceeding of the IEEE” featured a 3D model created by Zukor Interactive of a space-based solar power system. The 3D model was also featured in the article “Energy Conversion and Transmission Modules for Space Solar Power” authored by Paul Jaffe (U.S. Naval Research Laboratory and the University of Maryland) and James McSpadden (Raytheon Company, Space and Airborne Systems). The IEEE is the world's largest professional association for the advancement of technology. Zukor Interactive developed the detailed 3D model for Hubert Davis of the Solar High Study Group to illustrate their concept for a space-based solar powered system (SSPS). The SSPS is a series of satellites orbiting the earth that will collect solar power and beam the energy collected to receiving stations on earth. The satellites will orbit the earth in geosynchronous orbit in alignment with the equator. If deployed in sufficient numbers they could provide the electrical energy needs for the entire planet. Started as a NASA project in the late 1970s, Solar High’s SSPS can capture and transmit solar energy to the earth more economically than terrestrial sources of energy, including terrestrial solar. Hubert Davis is the former director of the Apollo spacecraft power and propulsion systems at NASA. Davis managed the Lunar Modules program, including LM-5, the Apollo 11 lunar landing vehicle as in "The Eagle has landed." which carried Buzz Aldrin and Neil Armstrong to the moon. After Apollo, he served as Future Programs Manager at NASA’s Johnson Space Center on the Inertial Upper Stage and Shuttle C Heavy Lift vehicles. He was responsible for NASA’s involvement with the Department of Energy in the Cooperative Developmental Energy Program and was a major contributor to the SSPS study. Through his role at the Solar High Study Group he remains a strong supporter of SSPS, working on several concepts for economical launch to orbit that can make space-based solar power more cost-effective than terrestrial sources of energy.